Although our Oceans Adventures program is usually mainly directed to teens, we are offering parents and their teens and even younger children a special “family program” over the winter holiday period, December 7-28, 2017. Everyone will also learn about the concept of Cooperative Ecology (CoEco™) – that all life forms are interdependent, and to the degree each individual co-operates (works together) with others and with the natural world, each has the best chance of living a long and healthy life. On our trips we learn to apply this viewpoint of cooperativeness toward solutions in everything we do—including family life and choosing adventures! Our Oceans Adventures winter break trip is an outstanding way to bring your family closer together, to do things you never do at home, and give them treasured memories for the rest of their lives. When your children are grown and on their own, you will all fondly consider your investment in a family vacation was highly worthwhile, as validated by survey in 2013. Show your teen this article (and the hotel video) and our Oceans Adventure website and see if they’d be interested in going with the family on this winter’s trip. 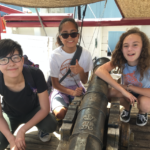 They will really love the awesome adventures they will have with the other teens going sailing, snorkeling, hiking, and more, and make new, lifelong friends! Your family adventure of a lifetime awaits you! Contact us soon to secure your spot!